We would like to say a massive thank you to Ivybridge Co-op and their customers and staff who have, through their Community Fund raised a massive £4264.58. This will fund organising and advertising our Friday excursions. Our County Council funding only covers essential journeys but not the Friday social trips which allow our passengers to get out, visit places and make friends. These excursions are time consuming and expensive to organise but greatly valued by our passengers. There was a danger we would have to stop providing them to reduce our costs. 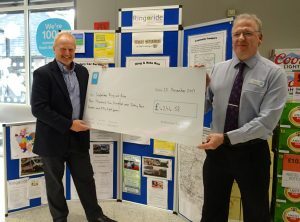 With this valuable funding from the Co-op we now able to cover our administrative costs and publicise the trips making them available to a greater number of passengers for the next couple of years. Already we have doubled the number of passengers on our Friday trips and we look forward to even greater success with this backing from the Co-op.